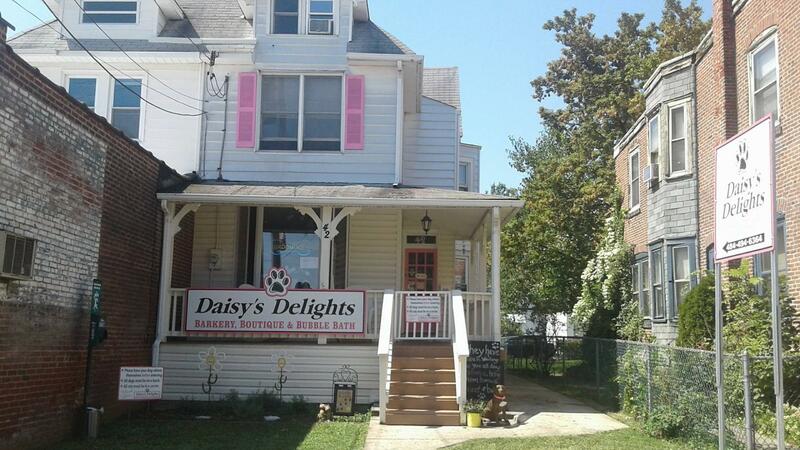 Daisy would have loved our new location! Come in and see us! Now offering "dog-free" cat boarding on the 3rd floor! See boarding page for details. Is your dog marking or having accidents? One thing that has personally helped me with my male dogs are Belly Bands. They are a great idea that saves your furniture or anything being marked on. They make a female garment as well! Look them up at http://BellyBands.net and tell them Daisy's sent you!! Our boarding rates are all-inclusive. There are NO additional fees for medicating, potty breaks, or exercise and playtime! We do ask that you bring your pet's favorite toy or blanket to make them feel more comfortable during their stay. And, please provide their food. Switching a dog's food, especially during a boarding stay may cause an upset stomach. *The Bordatella vaccine should be administered within 6 months of boarding. All pets must be atleast 10 weeks old, in good health and free from communicable disease for the previous 30 days. Pets that have been in a shelter are not allowed in the facility until they have been in a home for 30 days. This is to prevent the spread of communicable disease that may not have surfaced. Many canine diseases are common in shelters and can spread quickly although symptoms may not appear for up to 30 days. All pets must be free of all parasites including fleas and ticks. If your pet has fleas and ticks at time of check-in, they must be treated at owner's expense and/or may be turned away. Please let us know if you pet has any special needs (like if your pet has aggression issues, allergies, separation anxiety, afraid of thunderstorms, etc) so that we can better accommodate their needs. Over night boarding at Daisy's Delights provides a safe place for your cat or kitten while you are away. You provide the food and vet records, and we will provide the rest. Only $25.00 per day (1 cat family) 2-3 or more cats $10.00 additional charge per cat. (Drop off between 9-10 am and pick up is between 5-6 pm. (Additional fees will apply for late pick up or early arrival). Vaccinations are required for any boarding visit prior to your cat's check-in date. You may stop by with your cat's vaccination records, fax them, or send them to us by mail. Our Fax number is (484) 494-5685. We may be unable to accept pets with certain medical conditions in order to maintain a clean and healthy kennel. Be prepared to supply vaccination records, an emergency number, and instructions for feeding, and grooming. Separation from you and being in a new environment can sometimes produce stress in your pet. Stress can result in lowered immunity and resistance and sometimes even temporary changes in behavior. Do not feed your pet at least four hours prior to boarding. This will minimize the possibility of having an upset stomach. Because exercise and eating habits can change, some pets gain weight while at a kennel, while others may lose a few pounds. Please be sure to inform us of any behavior or medical problems that your cat may have such as allergies, medications, separation anxiety, fear of thunder, history of epilepsy, etc. As a pet owner, you should be aware that you are financially responsible for any veterinary care that may be required for your pet. All information which may help us care for your pet is pertinent. All pets must be free of internal and external parasites, and must not have been exposed to any contagious disease. If any fleas are found, your pet must be bathed at your expense. For the sake of all pets in our care, we reserve the right to deny boarding to any pet lacking the required vaccinations, any pet that appears to be behaviorally unsound or any pet that may have been exposed to contagious disease or internal or external parasites.